7700 years ago, Mount Mazama erupted and left only a caldera to be filled by centuries worth of rain and snow. 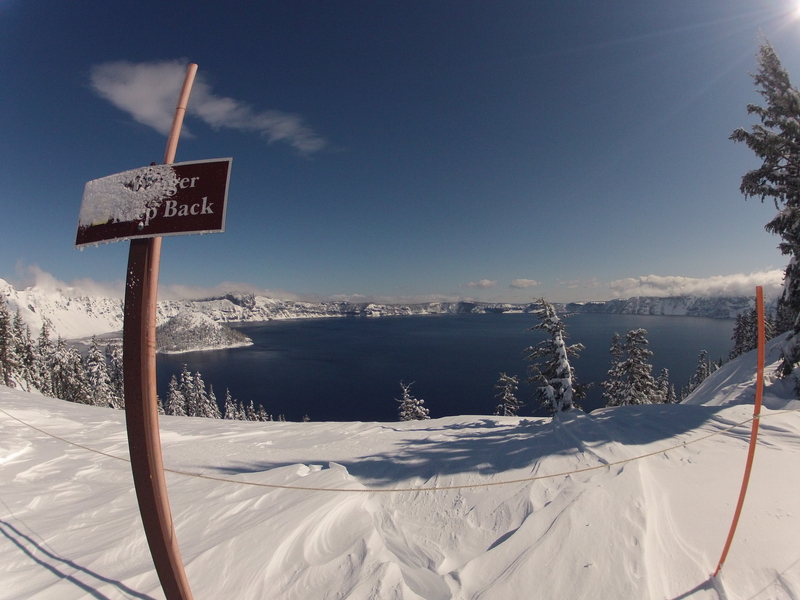 Today, Crater Lake is the deepest lake in the United States. While not a permanent home to people, Mount Mazama was a place for prayer and vision quests of the Makalak people. Today, I am here for my own vision quest, in the form a backcountry ski. Carrying a quiver (backpack) full of the “10 essentials” and armed with a pamphlet-based knowledge of the area, I set out in a counter-clockwise direction around the lake. I make fresh tracks with my touring skis along the marked route for twenty minutes and bring myself to the middle of a winter wonderland. Rolling, conifer-framed hills, allow for every level of expertise, physical fitness and time commitment. My one day exploration allotment leaves the thirty mile lake circumnavigation for another time. Most people enjoy the marked route along the road in three to five days, complete with the only rim camping allowed, but stories of single day accomplishments are plenty. I manage to hit the park on a gorgeous, late winter day. A striking contrast between pure white snow and clear blue sky was almost enough to make me forget about the potential for a winter sunburn. For those of you interested in motorized pursuits of Crater Lake winter fun, Diamond Lake Resort grooms the North Entrance Road and rents snowmobiles. Your reward for the ten mile ride is an amazing lake overlook. My Saturday, 8:30 a.m. arrival at the 110 year old Crater Lake National Park makes me feel like I am the only one there. The 128 mile drive down Highway 97 from Bend to Highway 62 has lead me to the South Entrance, the only road plowed in the winter, of the 249 square mile park. The sun is barely high enough to shine above the plowed snow banks along Munson Valley Road. Snow covers the South Entrance kiosk as if my daughter used too much frosting on its ginger bread style roof. While it marks the first semblance of civilization, I won’t see another person for more than an hour. Simply catching a glimpse of the 1,943 feet deep, six mile wide lake requires some exploration as it is hidden from the parking area near the Steel Visitor Center on the southern end of the lake. Once I posthole climb over a ten foot snow bank, the majestic lake shows herself in all her glory. A short while later my tracks would be used by a father transporting his six kids, one by one, to take a peek. Crater Lake Ski Patrol will eventually dig the path out for the day’s visitors. With Mother Nature dropping an average of over 44 feet of snow each winter, it’s easy to understand why the visitor center and Rim Village Gift Shop, complete with food and monogrammed goodies, both sit on the second floor of their buildings. By contrast, the steel tunnel to the single-story bathroom feels like you are in an Arctic exploration building. Throughout my ski tour, I manage to keep my childlike enthusiasm in check and keep returning to the picturesque focal point. Each trip back to the caldera’s edge provides me with a different perspective on its beauty. The signs warning visitors to keep a safe distance from the edge seem obvious until you hear a ranger tell you about the guy from New York who had to be rescued after tumbling down the caldera. The seven different types of trees on Phantom Ship Island are picture-worthy, but I came for the ski. While Elk, deer, black bear, bobcat, marmot and squirrel all inhabit Crater Lake, I am left alone by all non-winged creatures. After a full day of skiing various named and unnamed peaks, both along the road and further into park, I return to the to visitor center before it’s 4pm closing. Steel Visitor Center houses the ranger desk, and plenty of information to help you get the most out of your visit. If traveling with children, be sure to ask about the Jr. Ranger program. The return ski reminds me this is a national park that receives 110,000 visitors each winter. Sunburned tourists ski and snowshoe near the trailhead like bees to a hive, while fully-equipped backcountry revelers head out to camp along the rim (which is only permitted during the winter). Rangers leading snowshoe tours and discussing winter ecology depart at 1pm every weekend day from late November through April. Snowshoes are supplied for the popular, hour and a half, non-strenuous hike. At day’s end, I experience what my daughter calls, “the good kind of tired,” and my own regret for not having more time to spend here. I have already planned a circumnavigation trip for next winter.